Students in grades 5 and 6 are learning about the social and emotional component of the Wellness Wheel. Compassion and empathy are two important concepts students explore as young people learning to navigate their world. During class, we discussed why compassion and empathy are important in one's life. With compassion as one of our Lyme School values, we discussed how compassion and empathy often coexist and help people feel valued and cared for which adds to self esteem. 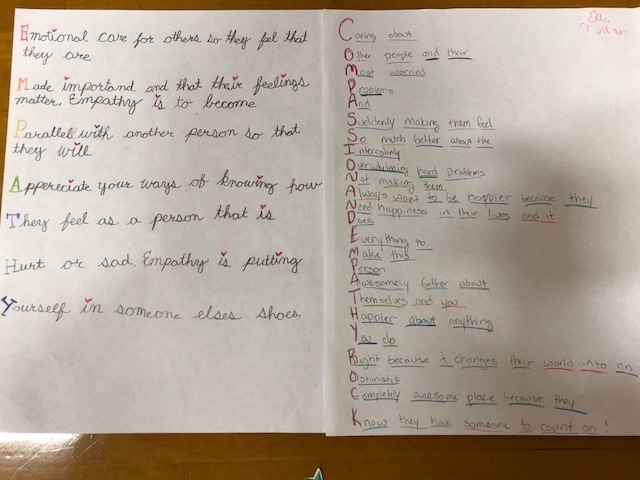 Our culminating activity had students write poems about compassion or empathy. Here students could express what they have learned about both in a creative way.